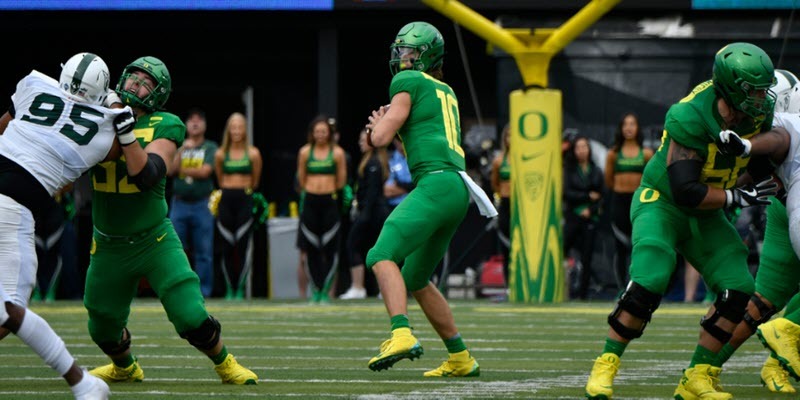 Today I want to stomp out the notion that the design of Oregon’s passing game under OC Marcus Arroyo is an unsophisticated attack that only sends receivers on long-developing deep routes. It wasn’t true last week, when the narrative started popping up across message boards, and it certainly isn’t true after the game against Portland State. After diagraming all of Oregon’s first half passes against Bowling Green, it was ridiculously clear to me that this aerial attack is not what it is accused of being. Almost every single play had receiver options at every level. What was happening was simple: the deep routes were the ones coming open. Another thing to note was that out of 13 first half pass plays, we saw 13 different route combinations. Nothing repeated. Saturday, the Ducks scored touchdowns from each level of the passing game: low, intermediate and high. Justin Herbert’s first touchdown pass of the morning was an arching deep pass to Jaylon Redd (yellow line above). The concept is called Slot Fade. The idea is to get the slot receiver a desirable matchup. The outside receiver runs some form of hitch to occupy the corner on top of him. The hitch can become the preferred route for the QB if the corner bails out. This concept is especially effective against man coverage. There also seems to be a high/low read on the backside between the Tight End’s post route and the Running Back’s drive route, which could be used to place the Middle Linebacker in conflict. You can see the Slot Fade concept in action in the video above. Here, Oregon gets the preferred man coverage with no safety help over top, and the result is excellent. The second passing touchdown of the game I’d like to showcase was Kano Dillon’s first score as a Duck. 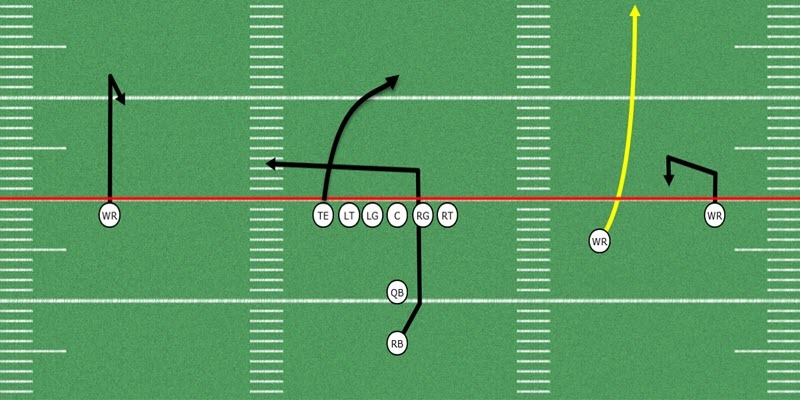 The play itself (diagram above) was a fake WR Screen that allows the slot and TE to release downfield, taking advantage of a defense caught off-guard. Both the slot and TE will slow play, acting like they’re blocking for the screen before taking off. The Slot’s route expresses itself as a fade, while Dillon’s (yellow arrow) is more of an angle route. Herbert finds Kano in the intermediate and the big man does the rest, carrying multiple Vikings into the end zone. Above is the Fake WR Screen in motion. The final score we’re going to take a look at was also the first for a Duck newcomer. This time it was graduate transfer Tabari Hines. This pass concept (shown above) is also a run concept, as it is part of the oft-discussed Run/Pass Option (“RPO”) family. These RPOs are so popular in football culture right now that broadcast commentators spend entire Saturdays calling things RPOs that are not actually RPOs. To be fair though, play action and RPOs can easily be mistaken for each other. In this RPO, Arroyo has combined the Zone Read with what is called an Arrow Screen. It’s basically a version of the Triple Option, but with the last option a throw instead of a pitch. Herbert can read numbers to the outside before the snap to decide if the Arrow (yellow arrow) is the optimal choice, or if he should carry out the Zone Read. Above, Hines gets the ball and almost walks into the endzone. The blocking from the other two receivers is fantastic on this play! In conclusion, it is easy to see that Arroyo’s passing attack is much more varied than some have been giving him credit for. That, on top of how well he’s doing with play calling, should squash much of the reservations many had about him. Though we can say that his calls haven’t come against top tier teams yet, he has been unpredictable and the offense has stayed incredibly balanced.